It’s widely accepted that the most practical solution for the removal of indoor air contaminants in dog kennels and other small animal confinement facilities is to dilute inside, ambient air with fresh, outside air. Thus, most kennel owners employ a complete ventilation system in their facility to properly circulate air and ensure proper health and growth of their animals. Depending on which part of the country you live in, nearly all dog and small animal kennels require a heating system. However, heating systems such as hot water or radiant heat, provide little or no room air circulation, so a ventilation system should be added to provide appropriate mixing and contaminant removal. Air borne bacteria, dust, small hair particles, dry and dead skin pieces, air borne diseases and toxic gasses all constitute part of the contaminants present in a kennel without adequate ventilation. This would be especially true with a kennel which has adjacent grooming facilities. Without sufficient air circulation, contaminants will remain in a continuous cycle within the room, traveling into the breathing zone, then slowly settling to the floor or nearest surface by gravity. These particles will then be re-dispersed by agitation (animal or human activity) back into the breathing zone, which can be a detriment to the health of the occupants. Of more immediate concern to kennel workers or groomers would be the development of a persistent cough—sometimes referred to as a “kennel cough.” This chronic bronchitis could be the result of the body trying to expel the tiny air borne particles, which are constantly being replenished. Speedy transport of these air borne contaminants to an operating exhaust fan is a must for a healthy atmosphere for any kennel or enclosed facility for raising small animals. Proper room air circulation can provide improved thermal comfort by the occupants. This is a result of minimizing the temperature differences in all parts of the room. No hot or cold spots are the result of proper air circulation. Circulation fans can eliminate hot, cold, or dead-air spots by properly mixing the indoor air. Adding controls, whether manual or automatic, can maintain the proper mixing all year long. A ventilation system must supply quality air continuously to the breathing zone of all occupants in the building or room. To meet this goal, this quality air must be distributed uniformly to all parts of the room. Air borne contaminants must be entrained into the circulated air and removed from any and all points in the room via exhaust fans where animal or human occupants are present. Inlets on the roof of the building or in the ceiling pull in fresh, outside air because of negative pressure created by the exhaust fans expelling the indoor, ambient air. Contractors have relied on the ventilation experts at Osborne for nearly 40 years to design complete ventilation systems for their customers. 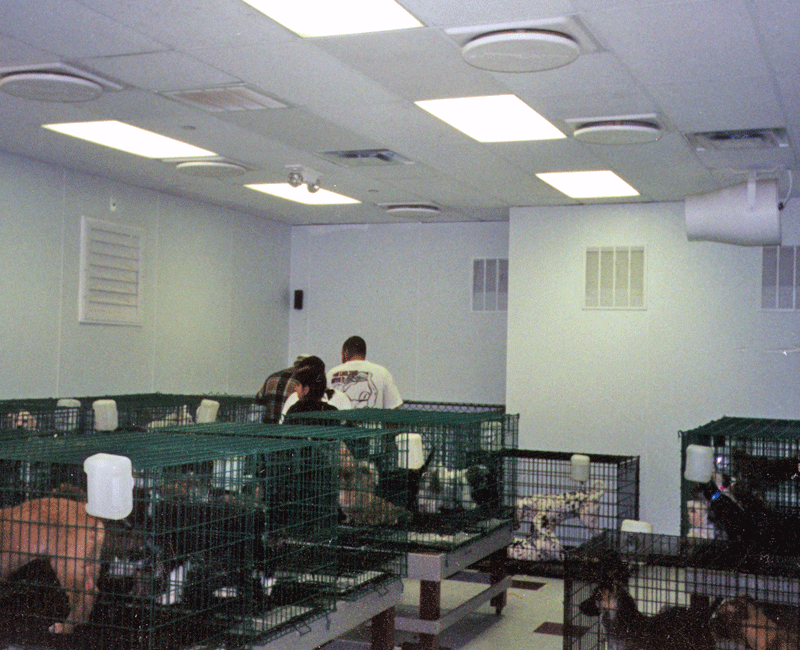 Utilizing the proper combination of exhaust fans, fresh air inlets, circulation fans, and controls, kennels and small animal facilities of all shapes and sizes have created and maintained the proper environment for growing animals. For more information or assistance in designing your complete kennel ventilation system, contact the ventilation experts at Osborne.